Have you noticed the Quilt Bee button on my left side bar? I think it made it's appearance sometime back in early December, maybe even late November. I decided to improve my quilting as one of my goals for 2010. That is a very broad goal and every goal needs baby steps in order to accomplish the final goal. So far I have joined: my local Quilt Guild, an online "Quilt Whisperer" class, DQS8, the Jacob's Coat Quilt along, and the Modern Tradition Quilt Bee. *phew* and the year is just gettin' started! I feel like I'm off to a pretty good start. I think that by joining these groups I will be motivated and "held accountable" since there are others depending on you to do your part. 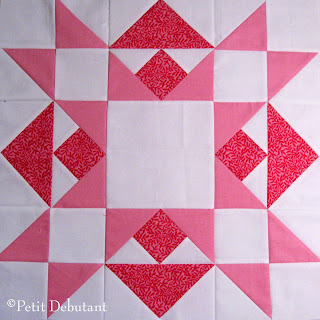 Melissa picked out a fun block and I must say I really enjoyed the process of piecing all those triangles. It will be sent off with the mail today. I must apologize to Melissa for my procrastination. Like I mentioned in my previous post I've been in a funk ever since moving and am just now trying to get back into things. Working on this block was very soothing and allowed me to unwind and focus on something other than kids, boxes, and messes! So did you set any quilty goals for 2010? uh...more specifically, the flying gees with the inset diamond. My big goal is to find more time to sew/quilt. Question, what is the name of that block? I am wondering how to do the "flying geese" segments of the block.